Chillbo Baggins Inflatable Sofa Just $49.90! Down From $80! PLUS FREE Shipping! You are here: Home / Great Deals / Amazon Deals / Chillbo Baggins Inflatable Sofa Just $49.90! Down From $80! PLUS FREE Shipping! Amazon is now offering this Chillbo Baggins Inflatable Sofa for only $49.90 down from $79.99 PLUS FREE shipping! The Chillbo Baggins Inflatable Lounger chair is a hot new product that lets you hang out in total comfort, wherever you are! It requires no external pump and is the perfect substitute for folding chairs, bean bags, hammocks, blow up chairs, picnic blankets and pool floats. It won’t leave you blue in the face from trying to blow it up. Simply unfold, scoop air into it and roll and buckle. Elastic loops allow you to anchor your lounger to solid ground in the windiest conditions. Compact portability, ease of use and eye-catching colors make Chillbo Baggins the perfect accessory for the beach, camping, fireworks viewing and music festivals. Awesome! FUNCTIONAL AND GOOD LOOKING Inflatable lounger available in your choice of 7 color combos. Elastic anchor loops let you stake down your inflatable lounge in windy conditions. Larger side pockets hold books, glasses, snacks and your ice cold beer. EASY TO INFLATE DESIGN. No pump required. Just 2 scoops of air and this inflatable lounge is ready to hangout in. You’ll be chillin’ like a villain in your comfy lay bag as your friends look on in envy! Use it as a pool float and replace that cumbersome inflatable chair hammock picnic blanket sofa or air bed. Chillbo Baggins does it all. FAST SHIPPING AND SATISFACTION PROMISED We are US-based company with a commitment to happy customers. We ship in 2 days, not 4-6 weeks like some European and Chinese competitors. If you are dissatisfied in any way, return it for replacement or 100% refund of your purchase price. SUPER VERSATILE DESIGN enhances all the awesome places that you might find yourself. 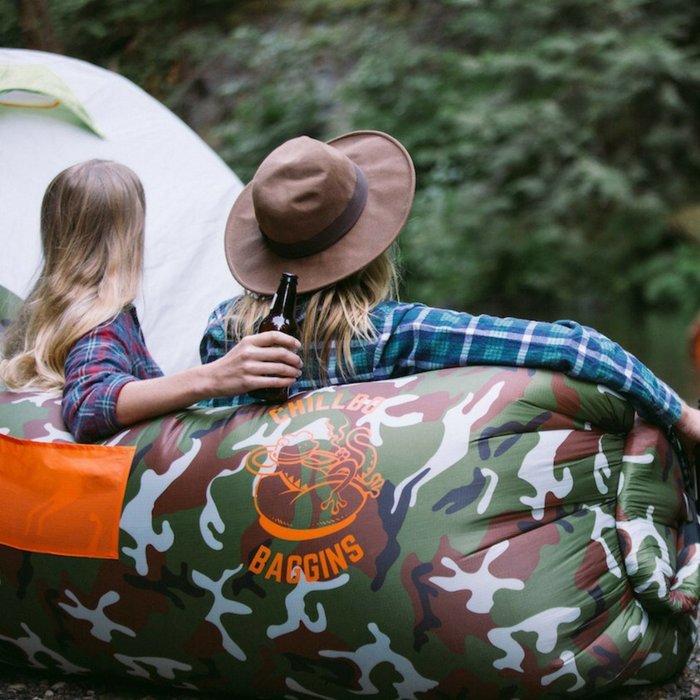 Whether you are at the beach, by the pool, camping, reveling at a music festival, picnicking with friends or reading in your backyard, Chillbo Baggins inflatable lounger is your ticket to chillax in style!